Are you ready for summer? How about kicking it off with a great GIVEAWAY? Hold tight for just a minute. 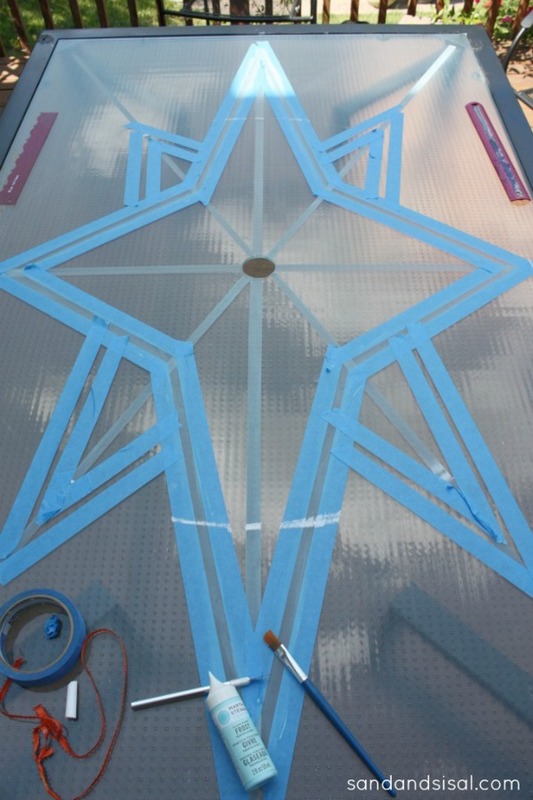 I had the awesome opportunity to partner with ScotchBlue™ Painter’s Tape and The Home Depot on this project. It’s part of their “Ready, Set, Paint” event and bloghop that features fun DIY summer painting projects by your favorite bloggers! 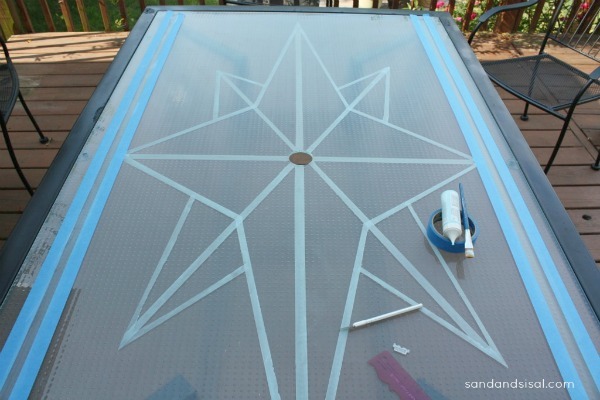 I’m going to show you how to get the look of a custom etched glass table. I was inspired by the design of a nautical compass rose, but you can use this tutorial to create any geometric design you desire. 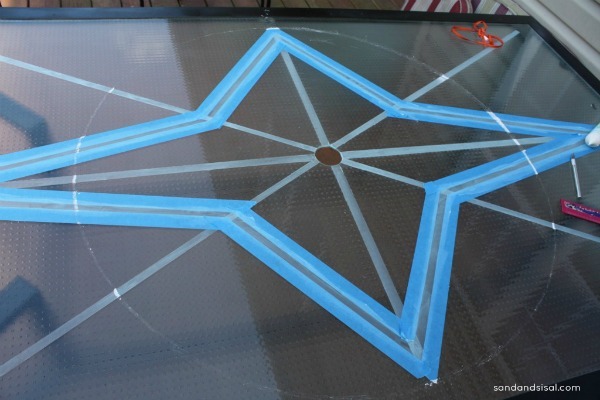 To make a Faux Etched Glass Table you will need the following items. Step 1) Clean the glass tabletop with glass cleaner then wipe it well with rubbing alcohol. The rubbing alcohol removes an soap and oil residue, helping the glass paint adhere best. 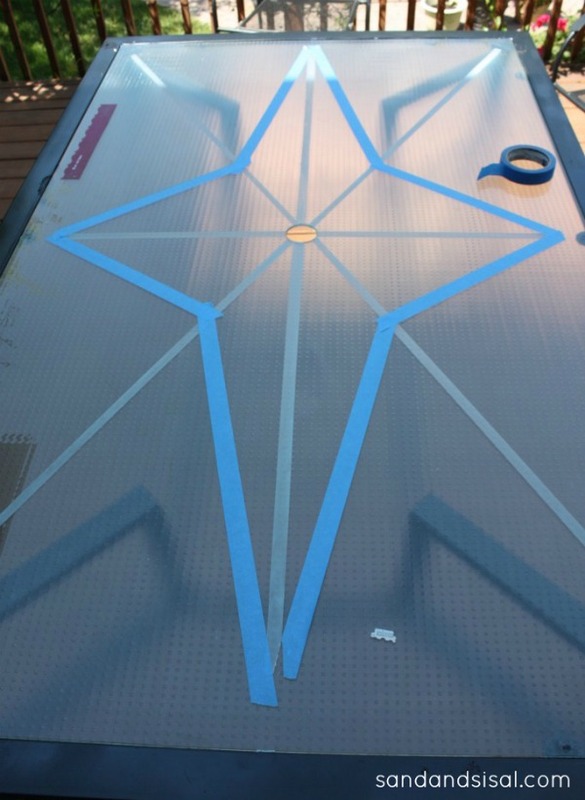 With your ScotchBlue™ Painter’s Tape , create a giant plus sign down the middle of the table and then an “X” starting at the corners. 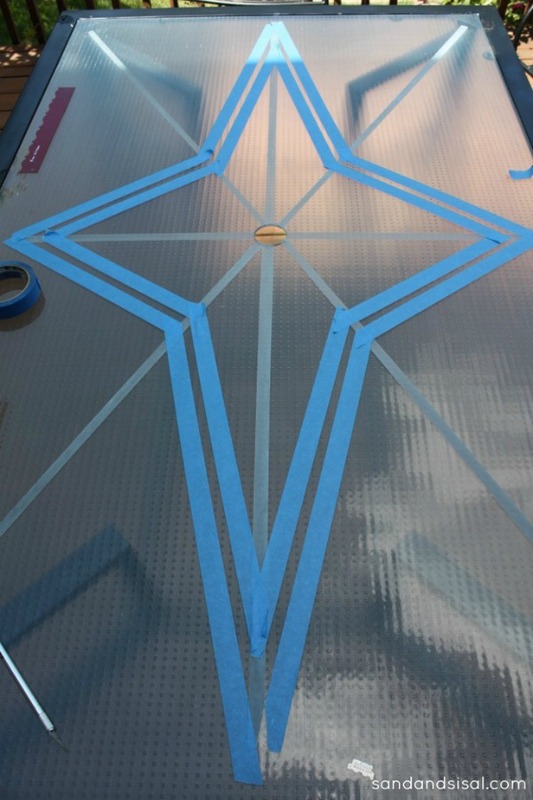 The space between the strips of tape is the area that will be painted. Use an exact-o blade to cut away any overlapping tape. 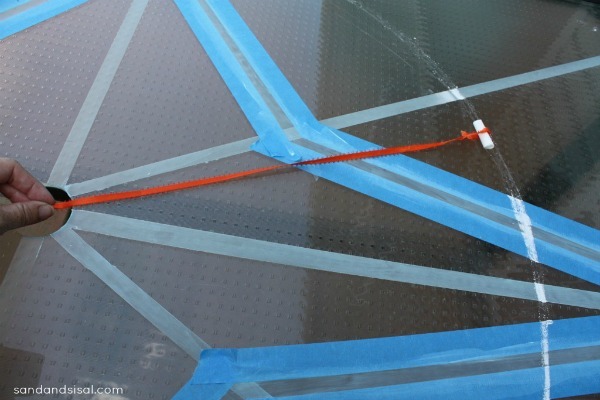 Step 2) Paint a thin and even layer of the glass paint onto the exposed areas between the tape. This glass paint dries very quickly which is great! It also will cure itself permanently in 21 days (even faster in the hot sun). You can see how I used this paint on my super easy DIY Sea Glass Vases. Step 3) Measure the distance from the center to the corner. Divide that measurement by thirds. That 1st third will be where your next rows of tape will meet the “X”. After taping, go ahead and fill in the areas with paint. Step 4) Tie a piece of string to a piece of chalk. Extend the chalk end of the string to the center of the “plus” you made and hold the other end at the center of the table. Now draw a circle. Step 5) The points where the chalk line crosses the “X” is where you will start taping again. Then paint like before. Step 6) With your straight razor blade, carefully scrape off the excess lines on your “X” and your “plus sign”. The paint will peel off easily with the blade within the hour, but don’t let the paint sit too long or it will be difficult to remove. I made a border with more ScotchBlue™ Painter’s Tape along the sides and ends. This is how it turned out! I love it! The paint is translucent and looks and feels just like etched glass! Want more DIY summer paint project inspiration? Then check out the ScotchBlue™ Painter’s Tape Pintereset Page & ScotchBlue™ Painter’s Tape’s Facebook Page and the The Home Depot Pinterest Page & The Home Depot’s Facebook Page. 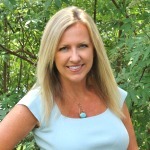 Be sure to visit the Ready, Set, Paint Blog Hop. READY FOR A GIVEAWAY? 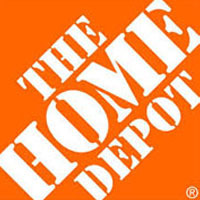 The Home Depot would like to offer one lucky Sand & Sisal reader a chance to win a $75 Home Depot Gift Card! To enter this giveaway, follow the instructions in the Rafflecopter entry form below. I LOVE compass rose designs. I hand painted one on a rug, this is a great idea, may have to try it on my table too! 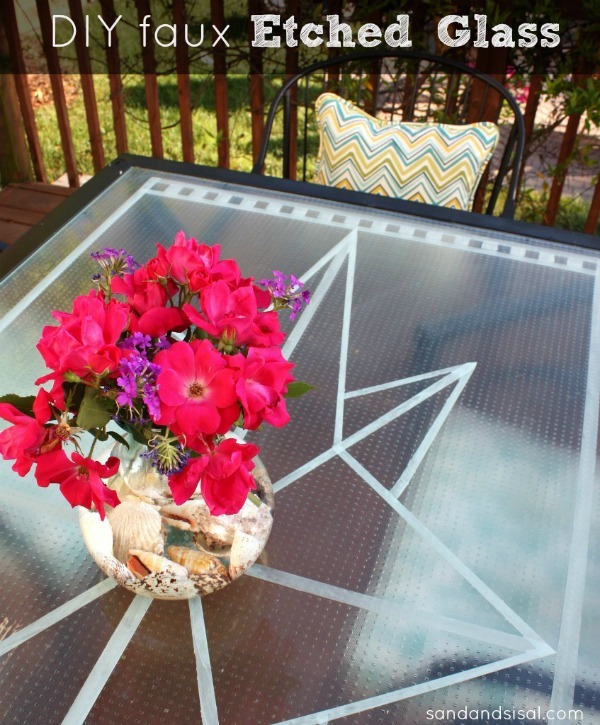 Love this easy summer outdoor enhancement! I think I am going to try it with a palm leaf design! 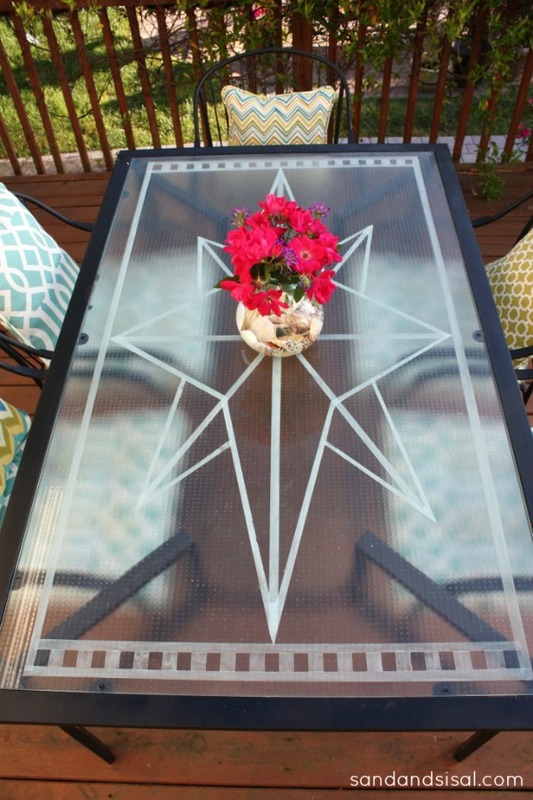 My patio table needs a new look. This could be it. LOVE THIS!!!! You make it so easy looking to do for a piece that would cost so much at the store – awesome job, as usual. This is fabulous! What a clever idea and it turned out beautiful. This is what I’m planning to do this summer when it’s too hot to be outside (I live in the South). I’m hoping to repaint furniture & do a couple of things to our guest room. Love this idea…it looks beautiful and for a fraction of what it’d cost to buy a custom table top. Great job! Here is the link to one of my favorite signs I have made. I just opened my etsy shop last week. I love beach signs and if I could keep this one I would!! This is fabulous! I want to try it soon. Would love to make these for our patio! What a great project idea! I’ll definitely have to try this! I just realized how many of your projects I have pinned! This will be the next one. I made one of these – now to keep from killing the plants. . . water, water, water! Wowsers! This looks great Kim! I love your table! It looks gorgeous! Your table turned out beautiful Kim! This is what I want to try! I have most of the supplies to do it already. Just have to get started. I have the exact same issue in my bath, this is perfect! This technique really adds so much to the tabletop. Thanks so much for sharing how you accomplished it. i love the table. it is really pretty, wish i could do something like that. This was my favorite that I’ve done… and only partially because it involved drinking a bottle of wine! Cement or hypertufa planters are in my garden’s future. I also have a glass patio table that could use some spiffing up. The design really dresses up the table. A little bit of work and it looks like a million bucks! Right now, this one is at the top of my summer to do list. It’ll be great by my pool area! Thanks for the great idea! Who knew blue painter’s tape could have so many uses! This is a summer project I just completed that I am loving! Love this! Thinking of other ways to use this idea. I just found some small cans of paint in our shed that are “fun” colors. I think I might try to paint one of our sad wood adirondack chairs some fun colors. What a fun project! I have a boring glass table that coule certainly use some punching up like this. And reading fail…I’m trying to get up the nerve to try watercolor pencils out. On a hot day on the TX coast, this sounds like a perfect project to try! Very nice! I would love to paint a “rug” on my patio. 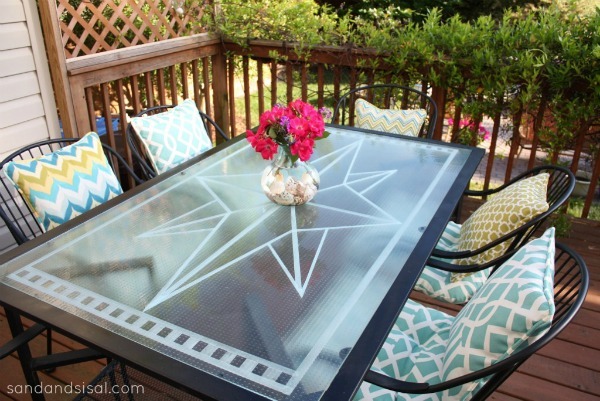 Love the etched glass table ! Love this table … my summer projects often revolve around my love of gardening … saw this today and think I’m just going to have to try it out!! 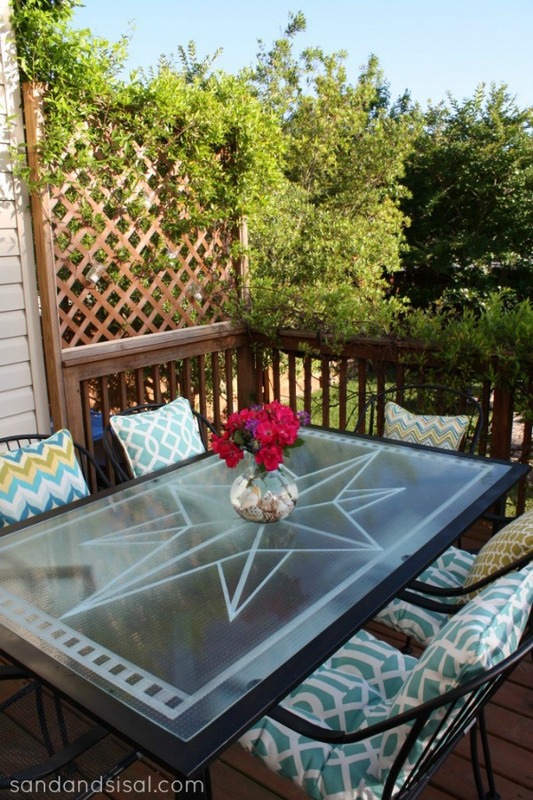 LOVE the table–I’m forwarding this on to my mom for their outdoor patio! I like Kim’s table idea! Would love to try these DIY sea glass vases – haven’t found the right paint yet, though. I LOVE this idea!!! You are so creative! Love this idea! Thank you for sharing!! Kim this is such an awesome DIY project!!! 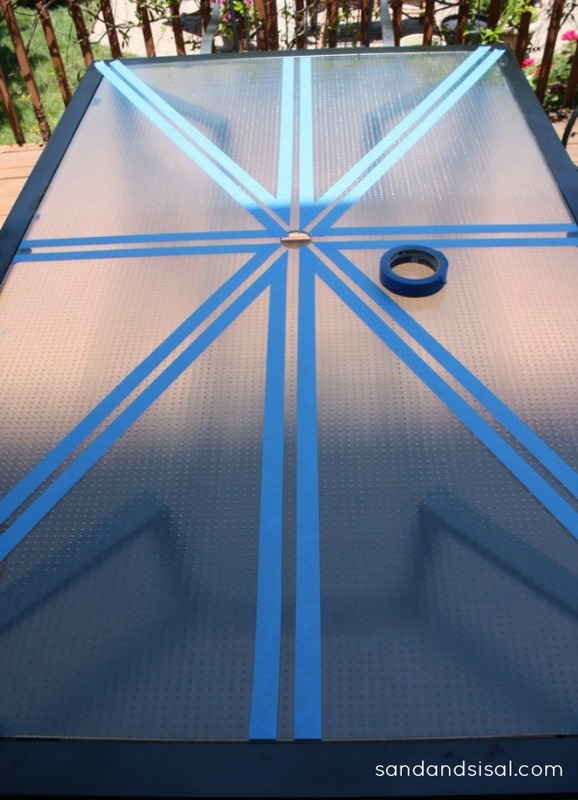 Love ScotchBlue Painters Tape and how versatile it can be!